The White Rose Hotel and Restaurant in the north Yorkshire Dales, formerly a 19th century residence, has been carefully and sympathetically refurbished to create a family-run hotel in the heart of Askrigg in Wensleydale, the location for many of BBC Televisions James Herriots All Creatures Great and Small series. 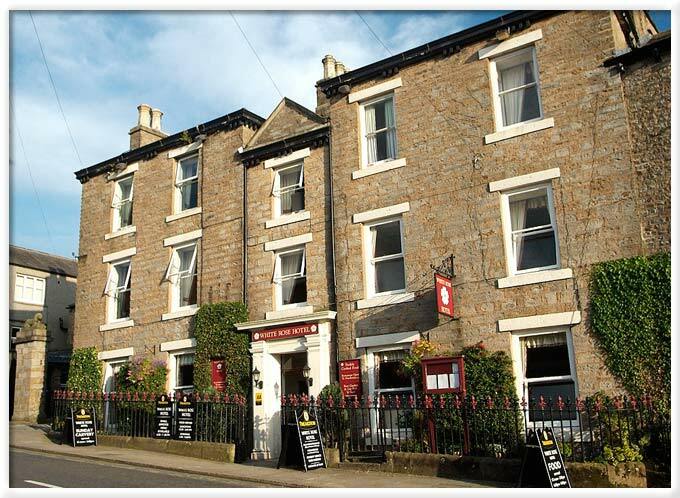 Here we provide excellent bed and breakfast holiday accommodation, plus a la carte restaurant meals and bar meals. We also provide for Functions, Wedding Receptions and Private Parties. For more information and photographs you can also visit our other website. Askrigg is a popular starting point for walkers. There are many circular walks, some taking in Mill Gill and Whitfield Force, the local waterfalls. It is also a convenient touring base for the Yorkshire Dales and the southern part of the Lake District. A day trip to York or the North York Moors National Park and Yorkshires Heritage Coast is also quite convenient with good road communications. If you want to find out more about this remarkable area, please visit the Discovery Guides Online Book Shop website. We are a family-owned and managed hotel, which is noted for its comfort, friendly ambience and great food. The White Rose Country House Hotel, Inn and Restaurant is located at Askrigg in Wensleydale at the heart of Herriot Country and the Yorkshire Dales National Park. We provide excellent hotel accommodation, inn accommodation and bed and breakfast accommodation, as well as warm and friendly hospitality and an ideal base for exploring the delights of Swaledale, Teesdale and the southern dales. Nearby famous tourist destinations include Aysgarth, Hawes, Leyburn, Masham, Ripon, Richmond and Reeth. This is excellent walking country amidst beautiful scenery and dramatic landforms such as Aysgarth Falls and Hardraw Force. History too abounds with renowned sites including Bolton Castle, Richmond Castle, Fountains Abbey and the Dales Countryside Museum. Why not give us a call today for more information?